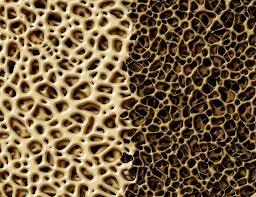 Osteoanabolics is a term used to describe a class of medicines used in bone health. It means "bone builders", and it describes the mechanisms of the drugs, not their chemistry or physical properties. Living bone undergoes continuous mineralization and demineralization. When the demineralization rate exceeds the mineralization rate, bone density declines, and many osteoporosis drugs work by lowering the rate of demineralization – or reabsorption of minerals back into the bloodstream. It's important to recognize that bone is a complex material and a composite of inorganic minerals and organic material. By weight bone is about 70% mineral (inorganic), but the organic material - collagen, other proteins, and living cells - are integral to bone. The authors of this article distinguished between drugs that work on inorganic tissue and those that work on organic tissue. Inorganic Tissue Builders include the nutrients calcium and Vitamin D and micronutrients such as magnesium. There is debate about whether supplements of these nutrients should be given to people with no obvious bone problems. See our pages on nutrition and Vitamin D for more on this controversy. But these nutrients do find use in management of osteoporosis. Recombinant (man-made) parathyroid hormone isn't exactly the same as parathyroid hormone produced by the body - but it works in the same way. The compound teriparatide is a version of recombinant parathyroid hormone approved for treatment of osteoporosis. In the bone tissue, teriparatide helps turn preosteoblasts into osteoblasts and thereby increases the growth capacity of the bone. Levels of the enzyme insulin-like growth factor-1 increase, too, and microarchitecture of the bony tissue improves. Parathyroid hormone from cadavers is administered by injection or patch. It is available in some countries, but not the US. Abaloparatide (a PTHrP analog) has also been investigated. Although expensive and difficult to use (it is administered by injection), teriparatide works well for a large portion of osteoporosis patients, at least in the first two years of therapy. It has side effects, as do all drugs, but they are generally tolerable for most people. Another interesting approach is the administration of calcium receptor antagonists. These stimulate the body to produce more parathyroid hormone. Scientists are interested in this approach, but no drugs are currently on the market. Strontium ranelate is the strontium salt of ranelic acid. Strontium is on the same column of the periodic table as calcium, so it has some similar chemical activity. Some bone cells have calcium-sensing receptors and strontium can act as an agonist on those receptors, thereby promoting the growth of osteoblasts. Strontium ranelate has dual antiresorptive and osteoanabolic effects - it both increases bone formation and reduces bone resorption. However, due to its connection with an increased rate of heart attacks, strontium ranelate is rarely used for osteoporosis treatment. Drugs acting on the WNT signaling pathway are now even close to coming to general availability for patients. Glucocorticoids are a common cause of secondary osteoporosis and this type of osteoporosis is due to reduced rates of osteoblastogenesis. It is therefore thought that glucocorticoid-related osteoporosis would be amenable to anabolic agents. A test comparing teriparatide and alendronate in patients found that indeed the osteoanabolic teriparatide provided better results.